By reviewing each lesson in Developing a Copyright Policy or Guidelines and completing your assignments with feedback from moderator Lesley Ellen Harris and fellow students, you’ll complete this course with a draft copyright policy, guidelines or best practices. This course is available on demand for groups. Contact us for more information about the scheduling of this course. All of Copyrightlaws.com’s courses are aimed at empowering non lawyers to deal with copyright and licensing issues. See our FAQs on how eTutorials work. You’ll receive a Certificate of Completion at the end of the eTutorial. See all our online copyright courses. This course forced me to do more “on my own” thinking, which is more powerful than hand-holding. I wanted a final guideline at the end of this course and ended up with a draft guideline, a bucketful of company-specific questions to answer, and an intention to pull together a copyright team. That’s an excellent outcome. Thanks to this course, we’ll likely propose new approaches to copyright/licensing/permissions processes. This course has been tremendously helpful in showing me crucial components for a copyright policy. It has helped me organize what’s needed in a copyright document, who needs to be involved from our staff, and has provided me with great examples of policy documents. Thank you! A super course. I appreciated getting your prompt feedback after posting my assignments. Thank you very much [for instructing Developing A Copyright Policy.] This course has forced us to put down on paper what we need to move copyright forward in our institution. 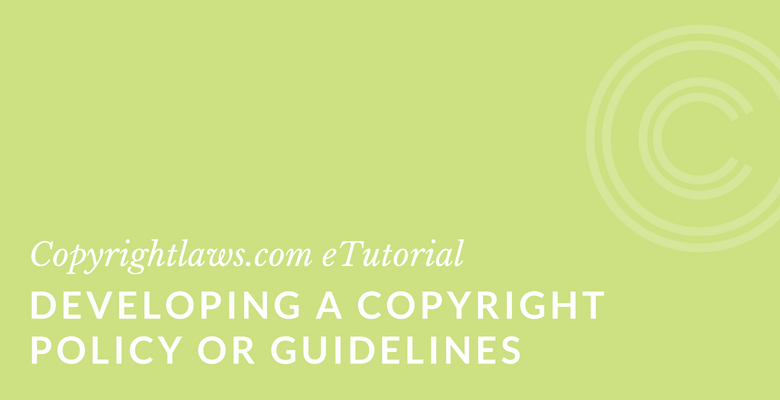 Developing a Copyright Policy or Guidelines is ideal for anyone who needs to have consistent rules for applying copyright law in their organization. Is This Course Based on U.S. Copyright Law? No, this course is about having the right tool for managing copyright and copyright compliance a — a written copyright policy or guidelines — and isn’t based on any one country’s copyright laws. Many examples of copyright compliance are included in the lessons in this course with an emphasis on U.S., Canadian and U.K. resources. Is This Course Aimed at Librarians? Although many librarians participate in this course, the course is ideal for any individual or organization. Every for- or nonprofit institution or organization would benefit from a written Copyright Policy or Guidelines. If you have any questions about this course, let us know and we’ll be happy to answer them. If you’re looking for a more in-depth review of copyright law and applying copyright to your every day copyright and licensing issues without the assistance of a lawyer, consider our Copyright Leadership Certificate program, designed to empower nonlawyers to manage copyright issues.